Depending on where you come from you might know the subject of today’s post under a different name. 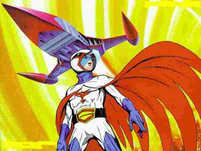 Â In Japan it was called Gatchaman (or Science Ninja Team Gatchaman if you prefer! ), whilst in the rest of the world it has been known as both G-Force and Eagle Riders. Â Here in the UK, we knew it as Battle of the Planets. The show originated in Japan in 1972, but was brought to the western world in 1978 by Sandy Frank Entertainment, who cut the original episodes up to remove some of the more violent moments, added a few new characters and generally made the show more palatable to western tastes. Â This meant poaching a fair few ideas from Star Wars, including an epic sounding theme song and a token R2D2 like droid, but more on that later. Battle of the Planets followed the adventures of G-Force, a team of five youngsters who defended the Earth from attacks from outer space, normally perpertrated by the evil Zoltar (an absolutely perfect name for a villain if ever there was one!). Â They travelled through space in a ship called the Phoenix, which in great Japanese tradition had a number of mini vehicles which the different members of G-Force could use. Â The Phoenix could also transform into a fiery bird like craft called the Fiery Phoenix, which looked brilliant and was often the easiest way to save the day at the end of the episode! Not sure if these sweeties quite made it to the 1980’s but they were certainly around in the late 1970’s. 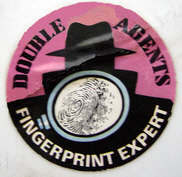 Â I was reminded of Double Agents when my parents dug out some old stacking blocks for my daughter to play with, and I discovered one of the old promotional stickers stuck on one of them. Double Agents were a series of small round boiled sweets made by Trebor, and were available in several different twin flavours, which is where the “Double” part of the name came from. Â The “Agents” part referred to the packaging being based around the world of spies, with each packet containing spy tips printed on the inside of the wrapper. Most of the different varieties consisted of a singular flavour of boiled sweet shell containing either a sherbet centre or a liquid gooey centre. Â Think of Sherbet Lemons for the former and Lockets cough sweets for the latter, although of course Double Agents weren’t intended to be medicinal like Lockets are. There were also Chocolate Lime flavours (I have a hankering for one of those right now actually) and Strawberries and Cream varieties. For more information on these great sweeties, take a look at John Gardner’s Double Agents fan site. Â Thanks for a reminder of the flavours, John! I’ve written before about sticker albums, where you buy packets of stickers in order to build up a full collection, and can swap with your friends any that you get doubles of. Â The same basic principle also applied to Bubblegum Cards. Bubblegum Cards were generally sold in packs of around five or six picture cards with a piece of bubble gum to chew on whilst you looked at the new additions to your collection. Personally I disliked the bubble gum, which was a large pink slither of hard, tasteless gum which splintered when you first bit into it, leaving your mouth full of cheek cutting wedges. Â But enough of the gum, it was the picture cards that were the important thing! I personally remember two sets of Bubblegum Cards, one for Star Wars, and another for the Superman films, which probably dates these cards to just before the eighties, but that’s close enough for me. 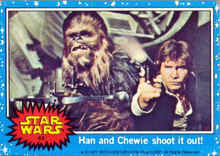 Â Each set of cards was further split into colour coded series which had images from the different Star Wars and Superman films. With my post on Flexi-Discs still fresh in my mind, I recall just how awkward they seemed to be to get them to play back on the family record player. Getting the needle to stay on the disc in the first place seemed like a chore, but even when I did manage to get it to stay on the sound that came out of the loudspeakers was often muffled and distorted and not really very pleasurable to listen to. Perhaps I just wasn’t very good at operating a record player, but I could play normal vinyl without much difficulty so maybe it was just our record player? How did you get on with the scourge that was the Flexi-Disc? Could you play Flexi-Discs successfully? Nope, they were a waste of time! Back in the eighties, way before the Internet as we know it was born, the only way to keep up to date with the latest news from your favourite bands was by reading one of the popular music magazines. Â There were many magazine vying for your attention, such as Smash Hits, New Musical Express and Melody Maker, so they often tried to woo new readers with covermounted goodies. Whilst posters and lyric books were always popular, the ultimate lure was to give away some actual music, and the way in which this was often done was to use a Flexi-Disc record stuck to the front cover. 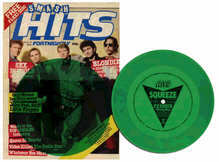 For the most part Flexi-Discs looked just like a normal single vinyl record, but they often came in various bright colours (yellow, green and red were always very popular). Â The biggest difference was that unlike a vinyl record, Flexi-Discs (as their name suggests) were flexible. Â Really flexible! Â They could be carefully rolled up into a tube if you so wished, although doing so was not really to be recommended if you want the thing to lie flat on your record deck! 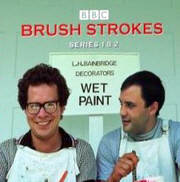 Brush Strokes was a BBC sitcom which first aired in 1986, and I personally remember enjoying watching it whilst doing my homework. Â Perhaps having the TV was the reason it always took me so long to write about Ox Bow Lakes or the murder of Archduke Franz Ferdinand? The programme was primarily about a painter named Jacko, played by Karl Howman. 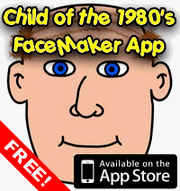 Â Jacko was a bit of a ladies man, but really you got the impression he really wanted to settle down with someone, but was afraid to do so, and was basically being told as much all the time by his co-worker and brother-in-law Eric. Jacko and Eric worked for Lionel Bainbridge (played by Gary Waldhorn, who is now probably better known as David Horton in The Vicar of Dibley), and Jacko was dating his daughter Lesley. Â Lionel’s wife Veronica also had a bit of a crush on Jacko, despite being old enough to be his mother. Another of Jacko’s love interests was Sandra, the secretary at Bainbridge’s, and indeed he even got engaged to her during the second series, but this relationship eventually fell apart.